Interval based solvers are commonly used for solving single-objective nonlinear optimization problems. Their reliability and increasing performance make them useful when proofs of infeasibility and/or certification of solutions are a must. On the other hand, there exist only a few approaches dealing with nonlinear optimization problems, when they consider multiple objectives. 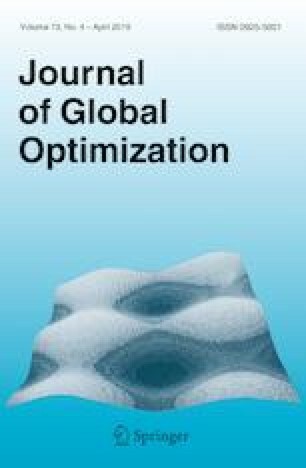 In this paper, we propose a new interval branch & bound algorithm for solving nonlinear constrained biobjective optimization problems. Although the general strategy is based on other works, we propose some improvements related to the termination criteria, node selection, upperbounding and discarding boxes using the non-dominated set. Most of these techniques use and/or adapt components of IbexOpt, a state-of-the-art interval-based single-objective optimization algorithm. The code of our plugin can be found in our git repository (https://github.com/INFPUCV/ibex-lib/tree/master/plugins/optim-mop). This work is supported by the Fondecyt Project 1160224.